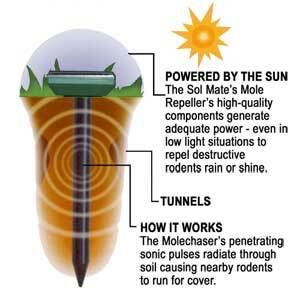 One of our most popular mole chaser units, the Solar Mole Repeller chases unwanted burrowing rodents with the strongest and least expensive power available - the sun. This Mole chaser is solar-powered and maintenance-free. Most underground rodents have poor eyesight, yet nature has given them a very acute sense of hearing and sensitivity to ground vibration. The Solar Mole Repeller exploits this sensitivity to produce a penetrating sonic sound of 400Hz over an area of approximately 7,500 square feet (1/6 acre) every 30 seconds. New and improved Design allows the repeller to be buried flush with the ground for easy lawn mowing. Insert the unit into the ground. The penetrating sonic sound irritates burrowing rodents and will send them scurrying away. 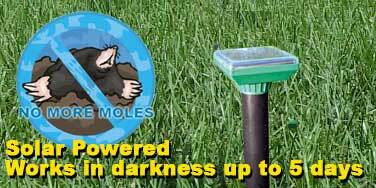 The Solar Mole Repeller uses state-of-the-art technology to get rid of moles, gophers, voles, shrews and other destructive burrowing rodents. The Solar Mole Repeller will work for up to 5 days without recharging. Do not expect instant reaction, repeller must be used continuously for up to 7-14 days before ground rodents start to move away from the area. The Solar Mole Repeller is environmentally friendly and eliminates the use of poisons and traps around your children and pets. The units discreet green-colored control head is watertight. Since one full charge yields up to 5 days of power, the unit is capable of operating even in the most unfavorable weather without interruption. Dimensions: 2 5/8" x 11 3/8"
Strong ABS housing protects solar panel. Can be buried flush with the ground for easy mowing. Mole Repeller - Solar Powered Regular $27.95 each. Moles react to certain sounds and frequencies of vibration. Disrupting their normal tunneling habits causes them to move away from their current location and search out new areas for tunneling!